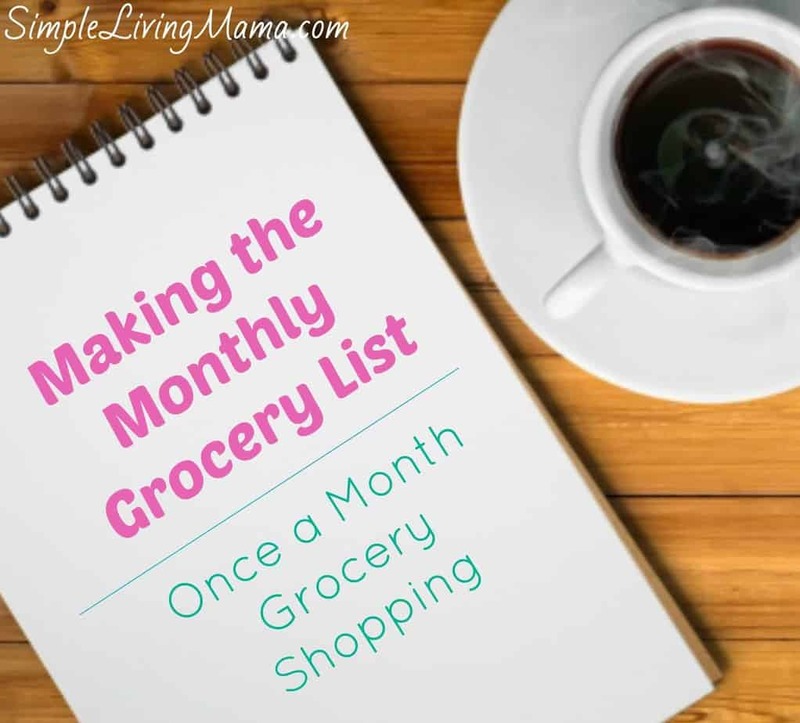 Now that you have made a master list of meals and taken inventory of your pantry and freezer, it’s time to make a monthly grocery list for your once a month grocery shopping list. This is fun for me! Look over your inventory and decide what you need. Also, think about any special meals you have planned that you will need ingredients for. 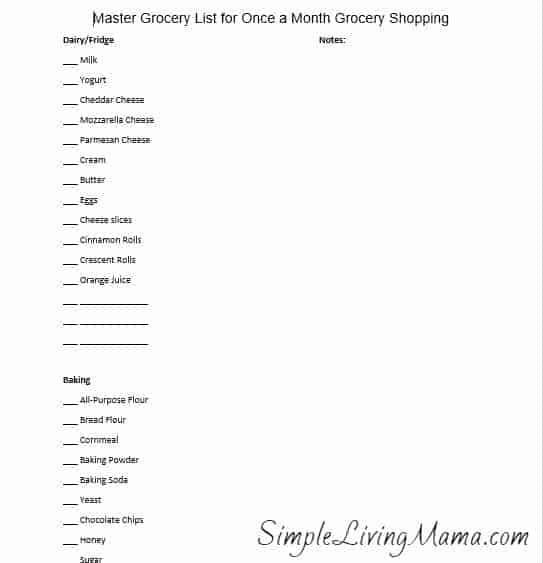 Begin by dividing your monthly grocery list into sections. If you do this, you won’t scramble all over the store searching for various products. Include a dairy section, produce section, miscellaneous section, etc. I have been working on a master grocery list. I thought I would share it with you! This list is pretty specific to our family, so your list will likely look different. If nothing else, my list will give you some ideas of things you might have forgotten about when compiling your own list. Just click below to download. Don’t forget your toiletry items. You know, those things that are not food, but you still need them to get by for the month. You’ll need toothpaste, soap, toilet paper, cleaning products, etc. I also like to glance through the current ads for the stores I plan to shop at. We usually only shop at one or two stores, but I like to see what is on sale. I do not make it a habit to plan trips around sales, but if something happens to be on sale when I’m going shopping, I’ll make a note of it. Typically, I do not use coupons. I just do not have time to sort through them. This is tough, and specific to your family. My suggestion is to do a trial run for one month. Keep track of how much you use of everything. Do you typically use four dozen eggs? How many gallons of milk do you need? You can freeze milk if you have the space, if not you may have to get enough to last two weeks. How much yogurt does your family typically consume? What about meat? If you do not do a trial run, you may not be able to get through the entire month before you need another trip. If you are doing a mid-month run anyway, you may need to restock other items. 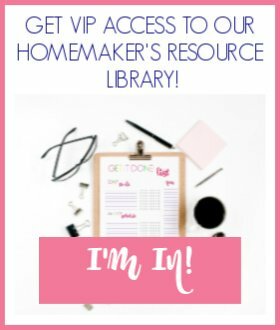 Want printables, all this information, and more in one place? 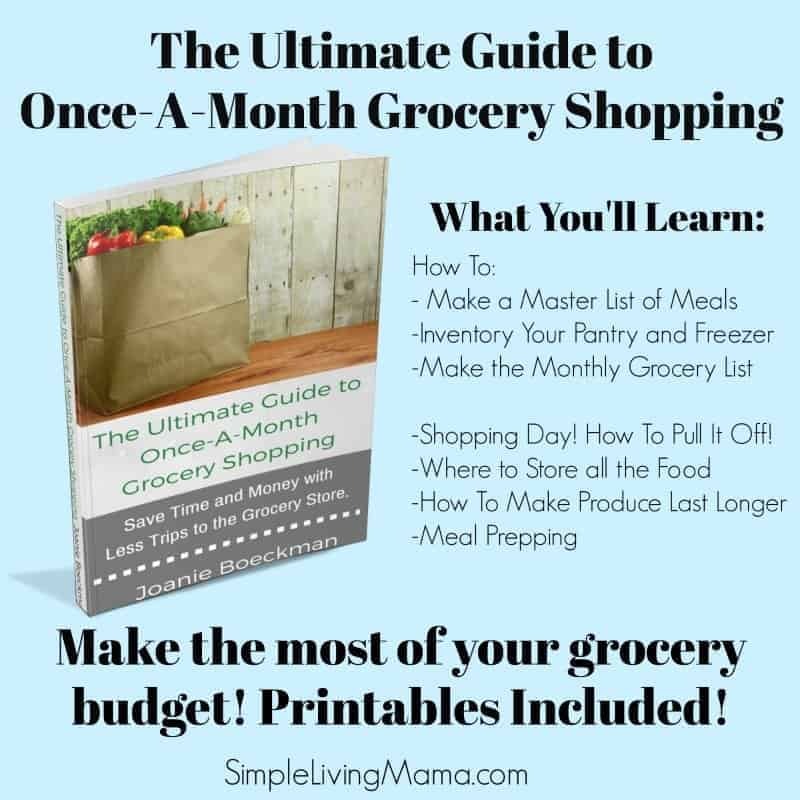 Check out my eBook, The Ultimate Guide to Once-A-Month Grocery Shopping! Thank you for sharing this! We are a family of five and I can’t keep the shelves stocked. I look forward to lowering our food budget and trips to the stores! I am excited about your great ideas as my husband and I prayerfully consider moving to a one salary family. How do you keep produce on hand for an entire month? Do you purchase produce weekly or buy frozen? 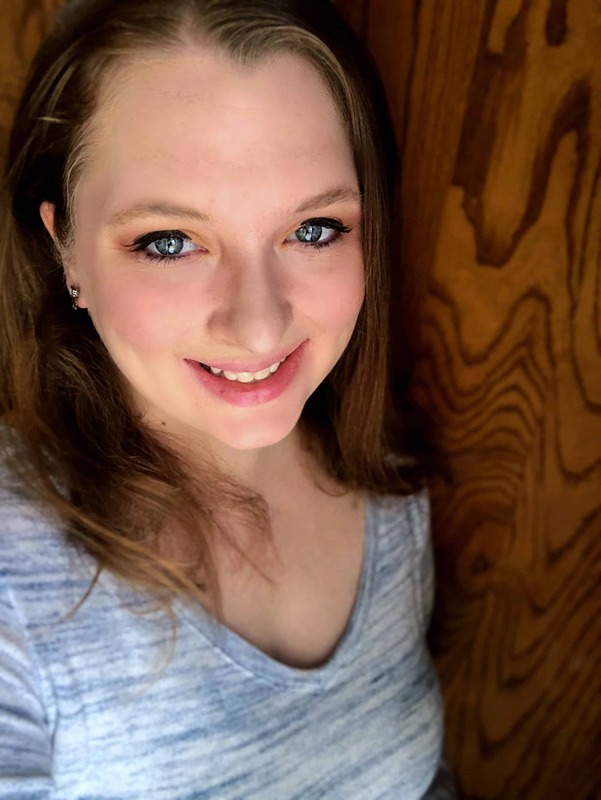 When I was still doing once a month grocery shopping, I would do a quick mini-haul about halfway through the month to pick up more fresh produce. Many items can keep all month, but for those that can’t we would pick them up every two weeks. I also utilize frozen produce.